Hybrid cloud is the future not public cloud, because control and privacy of data becoming a major concern to the corporate sector and medium sized companies. After floating information about PRISM, Google’s officially contradictory statements and Ban of some of Google App in some countries, it is quite clear that, the mass is rethinking about the words – Privacy and Security. Hybrid Cloud has the Hybrid Advantages, the cost of the flexibility is definitely the complex setup versus Private Cloud; while Hybrid Cloud demands some extra precaution. Basics on Hybrid Cloud Computing or How Hybrid Cloud Computing Works has been discussed before and we are not going in to in depth on the technology itself. Many analysts have always look at Rackspace cloud as a the potential competitor of Amazon AWS public cloud. Looking at the company’s San Antonio profile only does return nothing but a partial view of the real potential of Rackspace, which seems ready to invest in new contexts. While there are recent rumors that Amazon AWS is preparing their new range of private cloud and full jump in the hybrid cloud market (read versus OpenStack), it is precisely clear, the latter market is pointing to Rackspace. It is no coincidence that in a case study for the implementation of RackSpace OpenStack for private cloud infrastructure, one investment company declared themselves as they are ready to jump in a hybrid cloud solution without difficulty, trusting in OpenStack, and especially the community. Just the huge community of developers who are around OpenStack, has greater value of the solution and better guarantee of support to deal with any type of difficulty. Rackspace is not Hybrid Cloud, neither OpenStack – but the needed quality of support is warranted by Rackspace, OpenStack is an F/OSS with huge participation of the developers. After Google’s conflicting karma, a new company will definitely fear to use SaaS, will at least think about IaaS (Public Cloud) and rest of the options are Private Cloud and Hybrid Cloud. 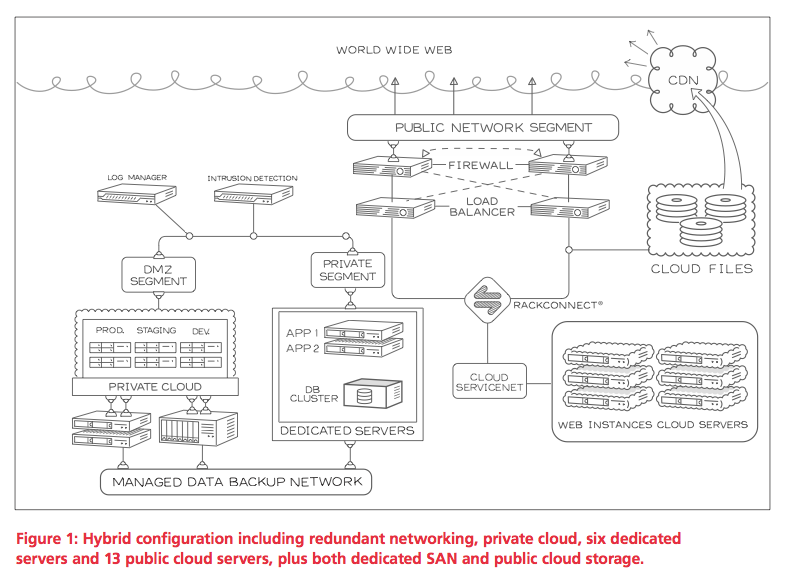 The illustration above is by Rackspace. As long term users, we think it is an easy to understand illustration. We have no right on the image explicitly. The hybrid cloud is the ideal solution in this complex situation, as it gives the client an infinite freedom to make decisions about the environment in which they can run the applications. There are no limits in this regard and every customer will have the opportunity to run the application where it makes more sense, translating from a public infrastructure to private and vice versa according to the needs and the level of desired security. Google Apps has been banned from Public Offices in Sweden for Privacy Concerns. Google clearly has been marked as an evil to a big users after the webmasters and Publishers – the comments on initial PRISM days were quite clearly exposes the psychology. It is fact that, many of these webmasters were not happy with Google’s abnormal official directives like Pop – do not do what you tell to your mother. SaaS has been killed for the future. These are practically childish comments in Business, definitely these has added more gray color to Google Inc. Google never could offer the standard quality of IaaS for Public Cloud though, when Amazon, HP or Rackspace are thought as competitors. Business sectors do have distrust on PaaS – PaaS is the only model where a free usage tier is offered with more control over SaaS. When Security and Privacy are becoming a big concern for independent, supported third party service – Hybrid Cloud’s inherited nature of full control by the owners of datacenter / Bare Metal (read the client company) making it more acceptable. This Article Has Been Shared 7778 Times! Public Cloud Computing falls under NIST standard cloud computing model and Public Cloud Computing hosted storage or apps can be accessed over the HTTP protocol. Cite this article as: Abhishek Ghosh, "Hybrid Cloud is the Future Not Public Cloud," in The Customize Windows, July 28, 2013, April 18, 2019, https://thecustomizewindows.com/2013/07/hybrid-cloud-is-the-future-not-public-cloud/.